When we begin to ask for help we must be willing to receive. Last week the doctor scheduled me for eye surgery this week. Recovery requires I keep my head and nose pointed to the ground twenty-four hours a day for several days. Talk about learning to receive help..... Wow. This experience places me in a situation where there are no other options. The willingness of the people around me to do the things I will not be able to do for myself is deeply touching. I am noticing and feeling the power of the flow of love from the generous giver to an open and grateful receiver. This powerful expression of love is expansive. It expands the energy of love in both the life of the giver and the receiver when both participate in the flow. What is more astonishing is how that combined expansive energy flow touches others in its presence and everyone expands. Thank you for the macular holes. I am grateful for the macular holes. I love the macular holes. The willingness to gratefully receive whatever is given to us whether we want it or not opens the flow of unconditional loving energy. Opening up that flow gives us the gift of experiencing the all knowing healing power of the benevolent unconditional love of the universe. In that one moment we contribute to opening that flow not just for ourselves but for everyone on the planet. Every act of love, kindness and compassion we direct toward ourselves creates the same loving expansion for all the lives we touch and far beyond. 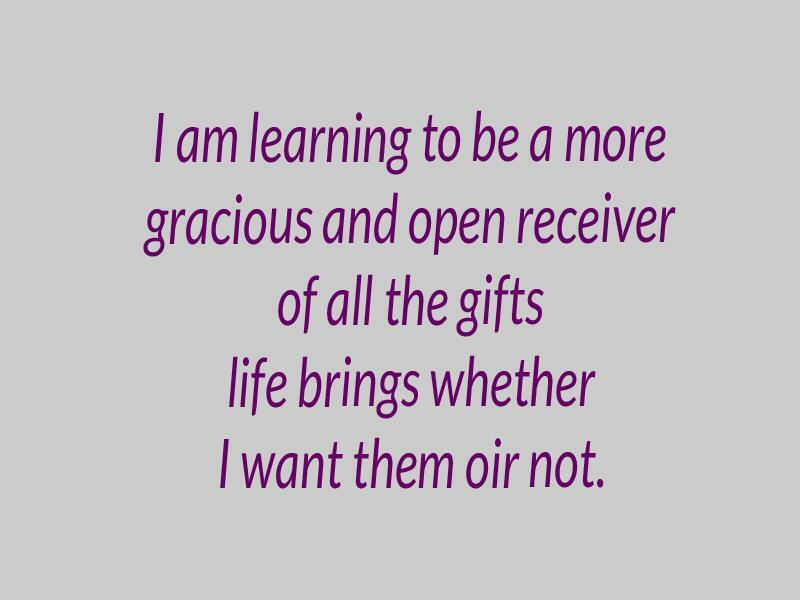 I am learning to be a more gracious and open receiver of all the gifts life brings whether I want them or not. What are you learning to receive?